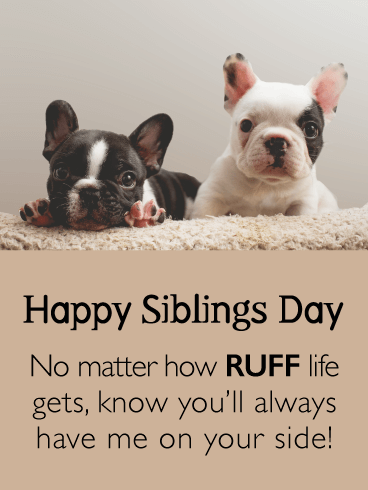 Whether you see your sibling every week or hardly ever anymore, the I’ll Always Love You Happy Siblings Day card is appropriate for any circumstance! 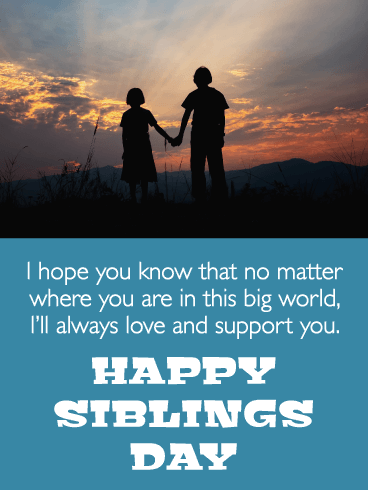 Send this breathtaking photo card of siblings holding hands while watching a sunset to let your own brother or sister know, that no matter where they are in the world, you’ll always love and support them. You don’t get to choose your sisters or brothers, so it’s always nice when they turn out to be exactly what you need! If you could pick a sister to swing into the sunset with, it’d always be her! 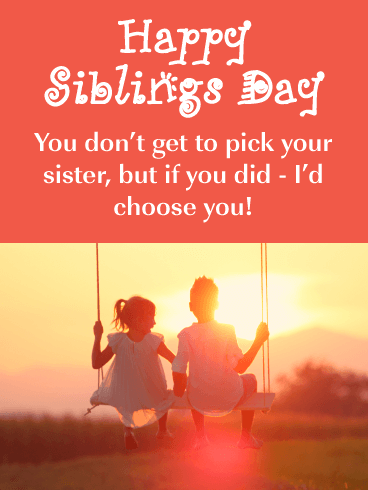 Let your awesome sis know how you feel on this Brothers and Sisters Day by sending her this sweet I’d Choose You Happy Siblings Day Card. No one dared mess with you growing up. And why? 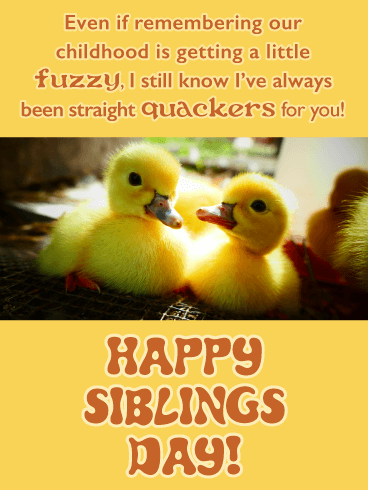 Because your amazing siblings always had your back! 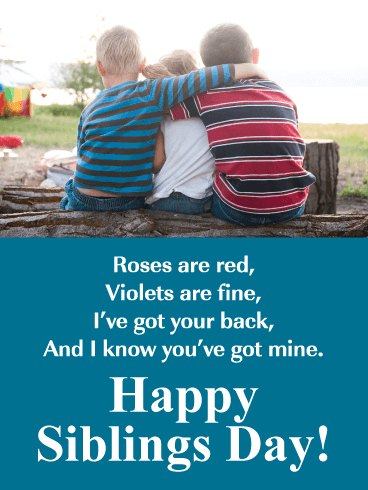 Send them this cute card with a fun, sibling twist on the classic “Roses are red, violets are blue” poem. 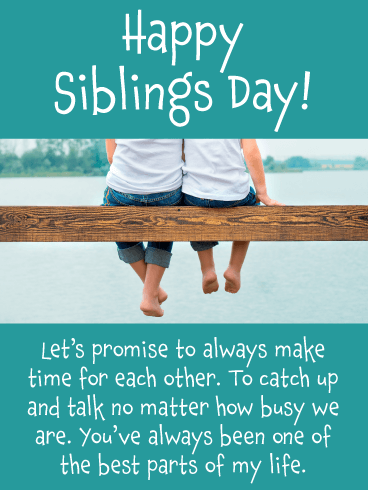 They may not even know it’s Brothers and Sisters Day until they receive the I’ve Got Your Back Happy Siblings Day Card! You’ve been through a lot together, and you’re not sure you could have made it this far without the love and support of your family. 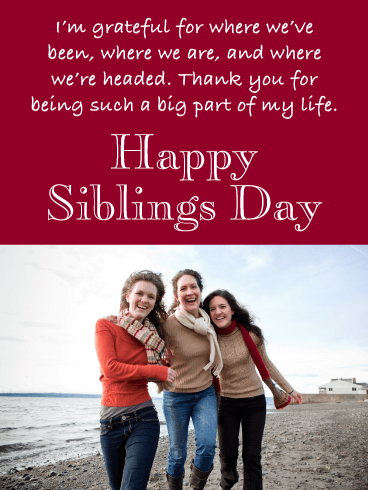 Return the love by sending them the Thankful for You Happy Siblings Day Card. Let them know how thankful you are to have them in your life, and how excited you are for your shared futures. Your sibling rocks. Mostly cause they are just as weird as you! They can keep up with all your jokes and shenanigans. You two were a handful for your parents growing up! 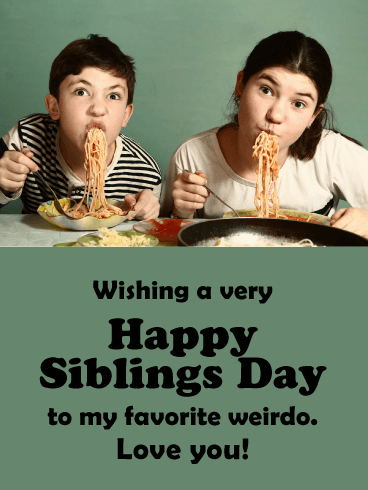 Send your comedic sidekick the My Favorite Weirdo card featuring a boy and girl messily eating spaghetti to put a big smile on your sibling’s face this Brothers and Sisters Day! Siblings argue. It’s just a fact of life. Looking back on things you and your own sibling argued about back in the day is actually pretty funny now! 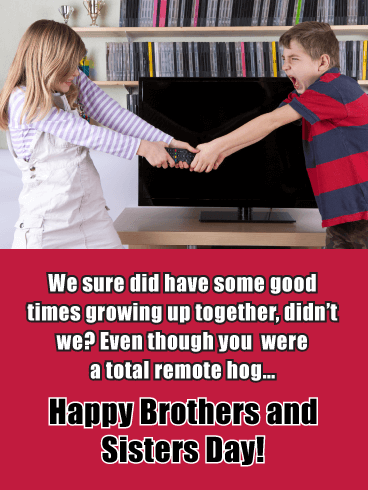 Like that huge feud over who got to hold the remote? 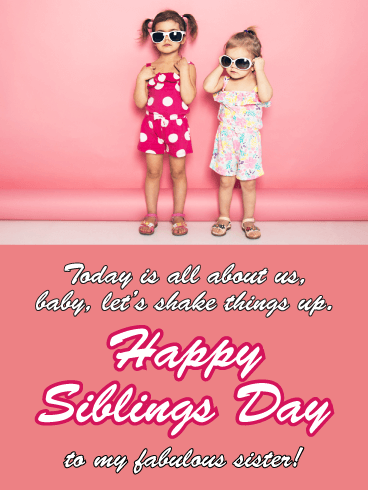 Remind your brother or sister of all the good times by sending the Arguing Siblings Funny Happy Brothers and Sisters Day Card.